Here’s another macaroni and cheese I saw on Food Network. Aida Mollenkamp threw it together at the very end of a show about various pasta treatments, almost as an afterthought, saying it was just that easy. Well, it is easy, but this recipe is kind of wack. Trust me, you’ll want to implement several changes. But let’s discuss the good stuff first. The flavor of this mac and cheese is absolutely delightful. I love the combination of assertive aged Cheddar, nutty Gruyere, salty Parmigiano-Reggiano and creamy Mascarpone. Then the sage elevates things to a chef-worthy place – it’s a simple, familiar flavor that you don’t expect in this format, and it even lends an occasional surprising crunch, having been fried in butter. I ask you, how could that be wrong? But that’s where the problems started for me. When Aida did it on television, the sage sizzled away in a skillet of melted butter that was later poured into the cooked macaroni, adding a small amount of liquid along with all that fragrant lusciousness. When I did it at home, the chopped herb promptly soaked up all the butter and there was none left to “turn golden brown.” The sage did eventually turn nice and crispy but it didn’t contribute to the moistness of the dish. The next thing that confounded me was the second ingredient listed: four ounces of Parmigiano-Reggiano. I have no idea how she yields four cups of grated cheese from four ounces of Parm. I used the smallest holes on my box grater, hoping for the finest, airiest result, and still ended up with just over two cups. Aida appeared to have a huge, fluffy cloud of Parmigiano on her cutting board. Mine, not so much. Another measurement is at the root of my third problem with this recipe. There is no earthly way that a pound of cooked noodles and more than a pound of cheese will fit into a 9” x 9” baking dish (unless it’s also five inches tall), yet it seemed too skimpy in a 9” x 13” pan (perhaps because I used large shells rather than small macaroni, but still…). I ended up using a shallow pan of indeterminate size, in which the amount of food just looked right, and since its surface area was larger than 9” x 9” I doubled the breadcrumb-and-cheese topping listed below. Finally, I must take issue with Aida’s instruction to cook the macaroni only halfway. Since the assembled casserole only goes under the broiler for a few minutes to brown the topping, the macaroni really doesn’t continue to cook in the oven. I recommend cooking it to the usual al dente stage, especially since the only liquid in the mixture is the cup of reserved pasta cooking water. When I added the grated cheeses to the cooked pasta, it took a lot of stirring to get everything to play nice and disperse throughout. Next time I’ll sprinkle rather than dump in all the cheese as I stir. Having made that concession, I still find it hard to believe that what I made in my kitchen could ever resemble the sinfully creamy-looking macaroni and cheese that Aida produced in hers. Mine had to be eaten piping hot, straight from the oven, because almost immediately the stretchy melted cheese began to cool and coagulate on the still slightly undercooked pasta. Remember, the recipe below is exactly as it appears on the Food Network website, but I implore you to take into account my suggestions. It’ll keep you from wasting a lot of expensive cheese and possibly even save you from the heartache of a disappointing recipe. I appreciate the complex, fragrant nature of this macaroni and cheese and think it deserves to be tried by all interested mac lovers, but sloppily written recipes from Food Network celebuchefs just make me mad (I’m talking to you, Rachael Ray). 1. Heat oven to Broil and arrange rack appropriately. 2. Butter a 9 x 9-inch baking dish and set aside. 3. Melt 1 tablespoon of the remaining butter and mix in a medium bowl with 1 cup of the Parmigiano and all the bread crumbs until thoroughly moistened; set aside. 4. Bring a large pot of heavily salted water to a boil. Add pasta and cook for half the time indicated on package. 5. Meanwhile, melt remaining 2 tablespoons butter in a large frying pan over medium heat. When it starts to foam, add sage and cook until crisp and butter begins to turn golden brown. Remove from heat and set aside until pasta is ready. 6. Reserve 1 cup pasta cooking water and drain pasta. 7. Return pasta to pot and place over low heat. Stir in sage butter, reserved pasta water, remaining 3 cups Parmigiano, Gruyere, Cheddar, mascarpone, and salt, and season with freshly ground black pepper. Stir constantly until cheeses are evenly melted and the pasta looks well coated. 8. 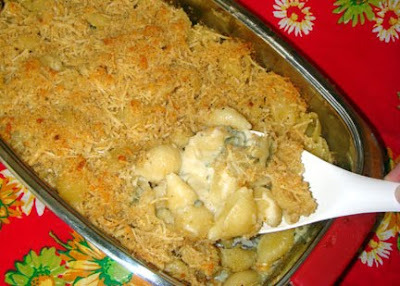 Turn pasta into baking dish and evenly top with bread crumb mixture. Place under broiler until mixture bubbles and top is browned, about 1 to 2 minutes. Let sit 5 minutes before serving. "4 cups of fluffy parm" easy, use a microplane..